- Leyte - or - Mindanao - as the State they live in, however if I look at the map all I clearly see is major cities. I have to go back and forth between concepts, are they talking about a city or a Province / State. Mindanao is the State, however the could say they live in Davao the large city and I would be happier to understand. There are 50 states or provinces in the USA, why would a person in the Philippines be expected to know all of them. When they do know, it is only because of the Football or Basketball teams in the state, without sports, most people would not have a clue. It would be much more correct than to say I live in Indiana, it is in the middle of the country close to Chicago, plus I really hate to say I am from close to Chicago, I am not the same culture as Chicago. I am a Hoosier. 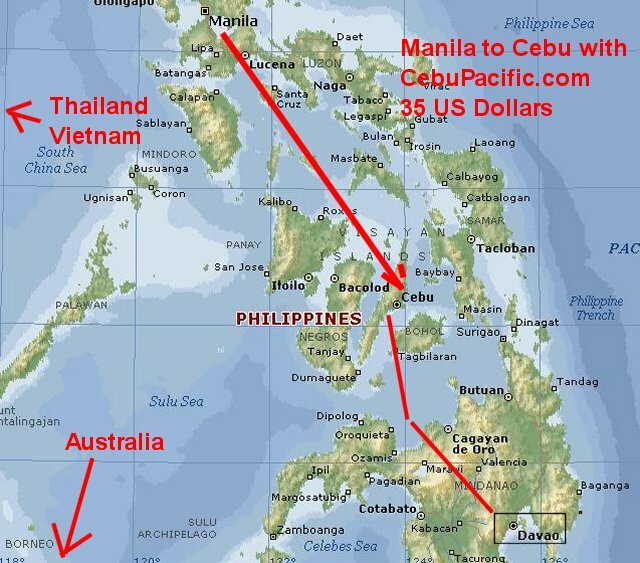 - I live in the Philippines, because today, now, I am living in Cebu, Philippines. Tomorrow, I may live in Manila, Philippines or who know where I live, it would make people feel safer I believe, although if you wanted a Philippines wife, you need to say you are from the USA or Europe and you go home soon. The last thing you want to do is learn the local language or care about staying, you are selling your good passport in exchange for a lesser passport. I am living in Cebu with my friend Chris a man from the USA that runs a call center, I often call him Hollywood because he like to wear the button down shirts, collar rolled upwards, and has this sort of spiked, on purpose, rumpled hair. He is a smart person; however, I am not sure I would pay to work nights in the Philippines trying to convince myself that all the person working for me worked good English. His hours are from sunset to sunrise, he has to be awake when the USA is awake as most of his clients are from the USA, and they hire a full time person to listen to them for 700 dollars per month. Chris has a housekeeper, I commend him on his housekeeper, I think it ludicrous for a person to live outside the USA and not have a cleaning person, janitor, maintenance man, and gopher. If, I were living in Cebu long enough, I would have at least five people working for me as my personal entourage of do anything I do not want to do persons. 2000 Pesos per month or 1.25 Dollars per day. That is the salary of the live in the house, 22 year old, wingy type maid; she is nice, however knows very little about anything and should go back to her mother for training. She is nice, just not fully trained, what do you want for 1 dollars and 25 cents per day. Chris says he is paying her double of the normal wages. This is includes food and a roof, she can then send most of her money to her parents that would expect her to send all of her money, and who knows why, but they all do. I think if I married most women, they would then expect me to send money. Full time cleaning person, living in the home, like and extra kid, that will actually do their chores. What a windfall, this is the luxury of living on the other side of the planet. There are many small little annoyances in the day of a person. These little mis-placed items, small clusters of problems, many ideas of things to do, all require time to perform. If for instance I wanted to clean my gym shoes, this would take me about one hour to do correctly. In the USA, it is more cost effective to just buy new ones, however here with the Maid; I could have her do it. I was laughing though; it is time to clean my clothes. The house cleaner in reality is bored out her head, and does all these repetitive type cleanings, like wiping the counter just to look like she is busy. She then wants money for laundry soap. All this is making me nervous, Chris has a business, he has a few employees, washing clothes is not a new concept in the world. She is probably on the two pieces of clothes to wash per day method. She is wearing the same clothes as yesterday; I will look at here tomorrow, and count the days. I cannot fathom paying a person 1.25 per day and not having the cleanest body and clothes on the planet. I would live in a spotless world. She is cleaning her clothes. I told here I would pay her 4 dollars or 200 Pesos; she was still winging about this. This is four days pay for washing clothes. I often in the poorer countries want to say. - IF you was not so F22king D23m Lazy, I would not have to listen to you tell me how you have no money. On the other hand, when the going pay is 1.25 dollars per day for menial labor, hard to get motivated. On the other hand, she does not get motivated for the 4 dollars for one-hour work, hard to believe it makes a difference. I think I will slap them, I can go to a Mall anywhere on the planet, and it is the farthest from special or unique on the planet. There is fish here, I think I want to find the water, find the fish, and see how they are fishing. I saw some damns on river, grouped up into fish farms from the airplane. I wish the people of the Philippines could understand English better; I could get a taxi driver to wander around the city with me. I am starting to dwell on the idea of buying a small day tour in cities. I am annoying myself by trying to read the guidebooks.